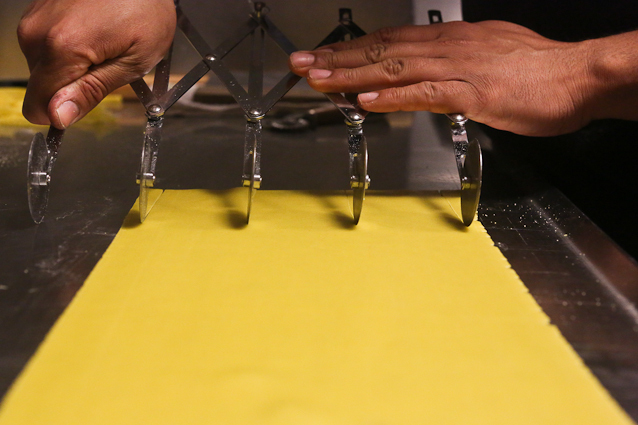 Fresh, handmade pastas are always going to be a big part of our menu. We love eating pasta ourselves, and so far, our guests seem to be enjoying them as well. A number of customers have asked how our various pastas are made and why particular noodles are paired with particular dishes. 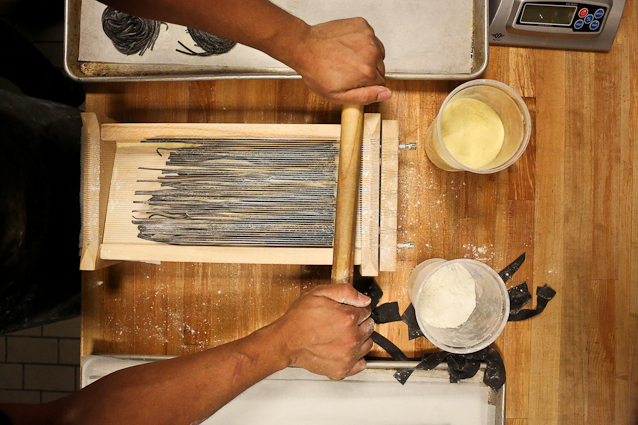 We make the pasta from scratch every day, so it was easy enough to put some photos together so as to illustrate how each is made and to explain why each is used in a particular dish. 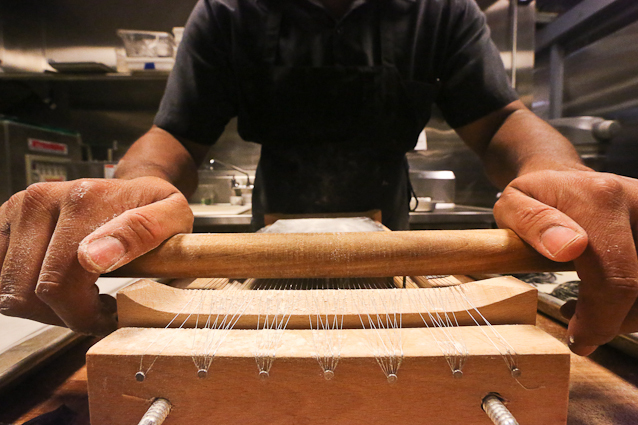 Thicker, squat noodles tend to allow chunky sauces and pieces of meat to cling to the inside or outside of the pasta. The size of the noodle generally matches the size of the chunks in the sauce. So the meat in the rabbit ragu gets trapped in the fine grooves of our house cavatelli, whereas the larger bits of lamb ragu go with the chewier, bigger, tube-shaped rigatoni. And of course, within those styles of pasta, there are so many variations. 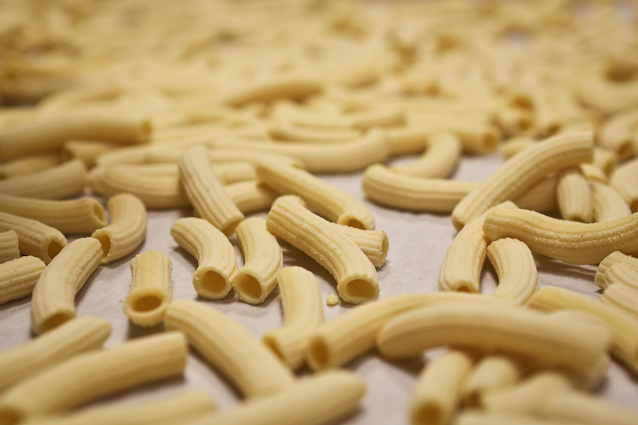 Rigatoni is an extruded pasta, meaning that the dough is fed through a small opening by force, then trimmed to size. It’s also an egg-less dough, which means it also allows us the freedom to make vegan pasta dishes for guests who can’t enjoy the typical menu offerings. 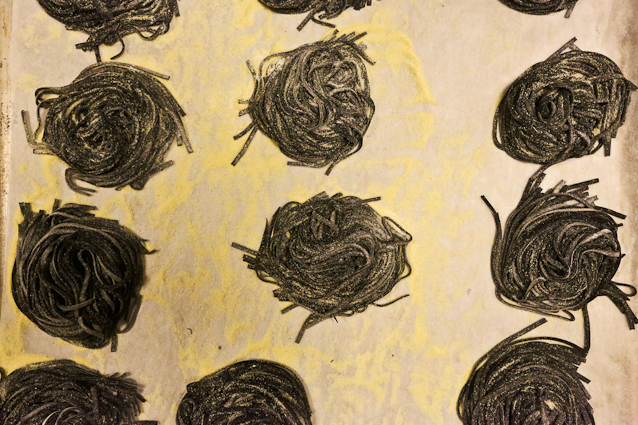 Thinner, angel hair-style noodles are better for thin sauces, like that found on our squid ink chittara. 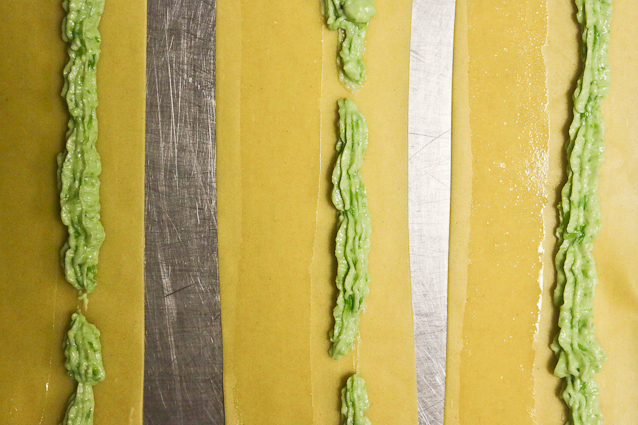 Oils and looser sauces coat the noodle and help avoid them sticking together. No one wants a gnarly bird’s nest of sticky noodles. Finally, gnocchi is almost more of a dumpling. 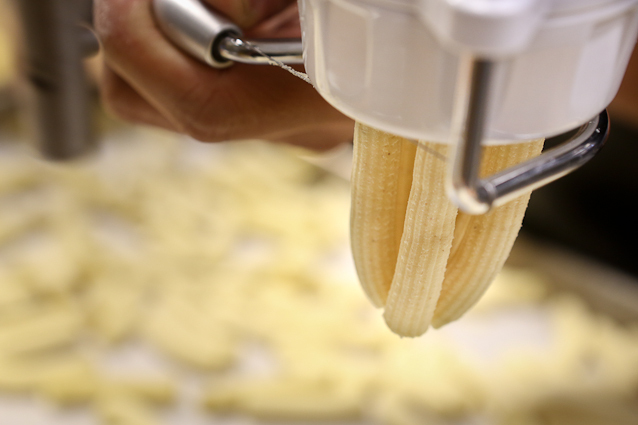 It can be made in several ways, all of which are among the easier forms of pasta to make. Ricotta-based gnocchi like we currently serve at Selden Standard tend to be lighter and more pillowy than its potato or root veggie derived cousins. 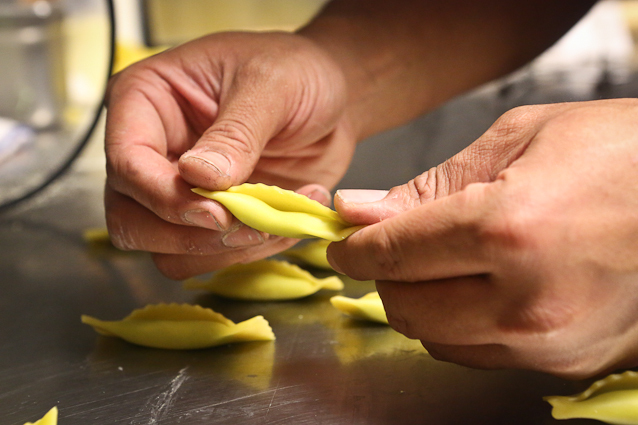 We’re fortunate enough to have a few people on the team who know how make our pasta, and we can make quite a bit in a day. But for those interested in trying out some freshly made pasta at home, Andy’s put together a simple gnocchi recipe that we’re happy to share below. In a mixer fitted with a paddle attachment (or alternatively, in a bowl using a spatula or wooden spoon), beat the ricotta, egg and yolk, salt, zest, and herbs for about a minute, until smooth. On a cutting board or other work surface, spread half of the flour in a thin layer. Spread the cheese mixture over the flour, sprinkling the rest of the flour over the cheese. Using a pastry/bench scraper, chop the mix into small chunks. 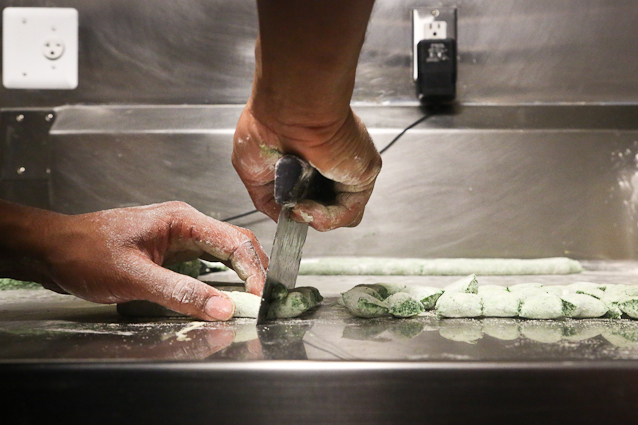 Incorporate the mix back together by gently folding from underneath without actually kneading the mix. Repeat the process until most of the flour is incorporated. Then bring the mixture into a ball and gently knead 2 or 3 times until smooth. Do not overwork the mixture. Cover with a towel until you’re ready to form the gnocchi. Cut the dough into six equal pieces. Lightly dust the work area with flour, and using your hands, gently roll each piece into a half- to three quarter-inch thick log. Repeat with the other five chunks of dough. 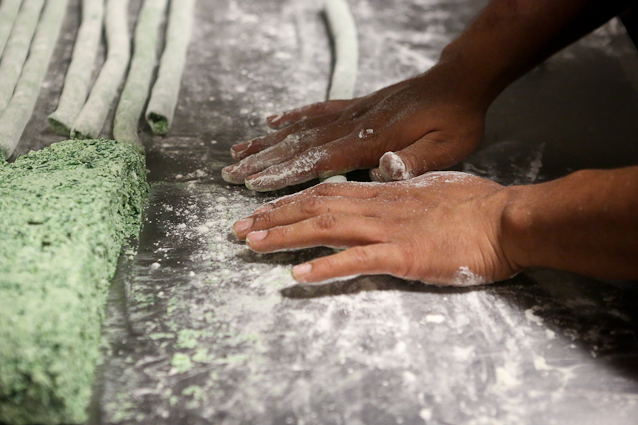 Then cut each log into small gnocchi, placing the finished gnocchi on a floured sheet tray. At this point, you may freeze them for storage or you may cook them. 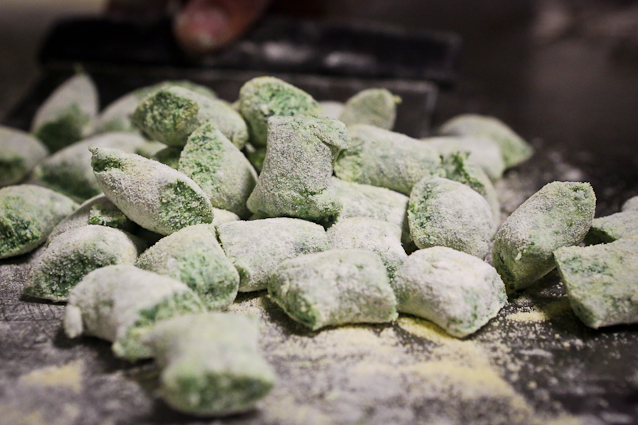 To prepare them to eat, gently drop them in boiling water for a couple of minutes until the gnocchi float. At this point, you may toss them with your favorite sauce: We suggest some butter and herbs, a pesto, or a simple tomato sauce. Come over here, kid, learn something. You never know, you might have to cook for 20 guys someday. You see, you start out with a little bit of oil. Then you fry some garlic. Then you throw in some tomatoes, tomato paste, you fry it; ya make sure it doesn’t stick. You get it to a boil; you shove in all your sausage and your meatballs; heh…? And a little bit o’ wine. An’ a little bit o’ sugar, and that’s my trick. Balancing out sweetness in a drink is often done with citrus — lime in a margarita, lemon in an Aviation, etc — but when we recently tried the verjus from Black Star Farms, we decided it had to become a staple behind the bar. Especially for the summer. Pressed from unripened (green) grapes, verjus is simply tart grape juice. Typically, a bartender would shake a citrus drink for several reasons, not the least of which is the cloudy appearance citrus gives to a cocktail. But the distinctive flavor and translucent appearance of verjus gives bartenders a few more options. For the past few weeks, we’ve been running a couple of verjus-based drinks, and we figured we’d share the recipes. 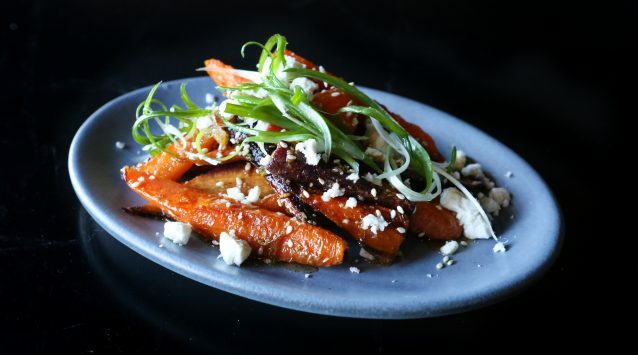 In addition to the Michigan-made Black Star Farms verjus, there’s a decent offering from Bonny Doon in California that can be found in metro Detroit as well. So if you can’t find one at your local store, hopefully you can find the other. When we first got our sample bottle of verjus, the very natural acidity of the unripened grapes started us thinking about other fruits. Pear leaped to mind, and we loved the resulting drink. Sadly, our guests drank the distributor out of the pear brandy we were using so we had to remove the drink from the menu after only a few weeks. 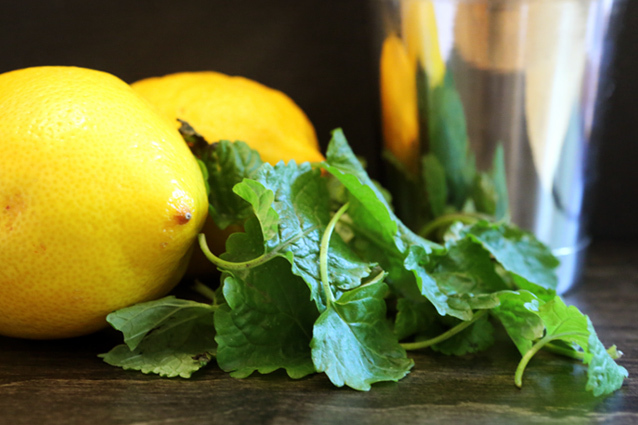 But we think it’s a great spring/summer stirred drink, albeit deceptively strong. Combine all the liquid ingredients in a mixing glass and stir with ice until chilled and properly diluted. Strain into a chilled cocktail glass and garnish with the lavender. 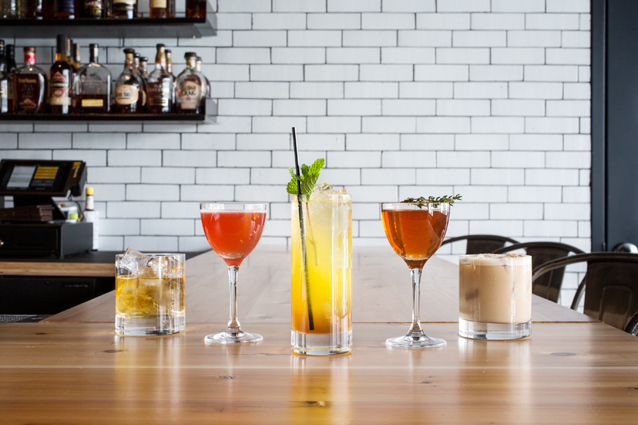 Product notes: If you’ve never tried any of the products from St. George, the Bay Area-based microdistillery, you’re missing out. Their “All Purpose Vodka” has great texture and roundness, their gins are widely regarded as classics, and they make tremendous un-aged fruit brandies, like the pear, that really carry the essence of the fruit into the spirit. 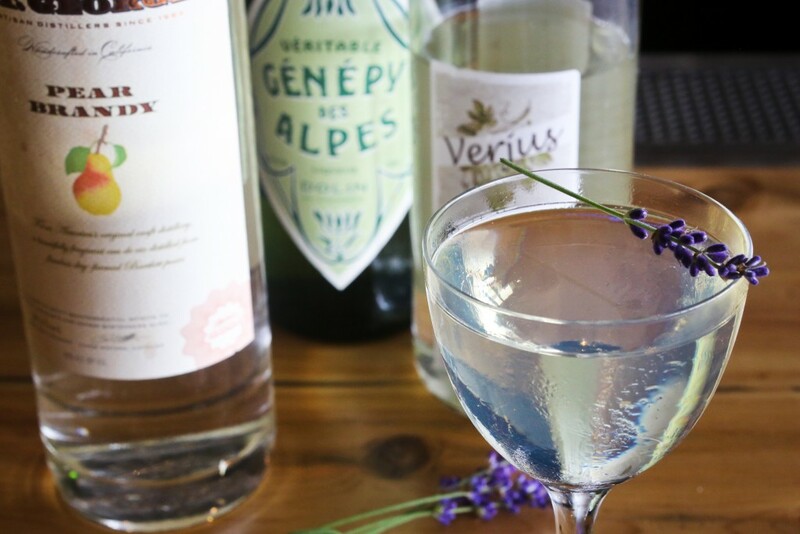 This particular genepy is made by the vermouth producer, Dolin, and imported by Haus Alpenz. Some people compare it to Chartreuse because the herb/shrub genepy is a key ingredient in Chartreuse. But while it shares some characteristics, while they’re both excellent ingredients, and while they are certainly in the same family of spirits, there’s no mistaking them for one another. We made the rosemary tincture ourselves by soaking some rosemary in vodka for 3 or 4 days and straining it out. The drink is, of course, still quite refreshing and delicious without the rosemary, but that extra herbal note adds some complexity that we preferred. When we had to pull the pear brandy cocktail above off the menu, we went in the same direction for a replacement — fruit brandy and verjus. In this case, we turned to Laird’s apple brandy. The heavy dose of creme de violette makes this extremely floral, which isn’t for everyone. But the verjus does a nice job of balancing the sweetness from the liqueur. Combine all the ingredients in a mixing glass with ice and stir. Strain into a chilled cocktail glass. Poor sherry. For the latter half of the 20th century, this historically beloved fortified wine had been largely shoved aside, often relegated to the dustiest corner of the liquor cabinet behind an old bottle of Canadian whisky and stale vermouth of indeterminate age. Thankfully, as is true with so many traditional forms food and drink that once seemed all but forgotten to popular culture, dry sherry increasingly has been finding a home at dinner tables once again. If I had a thousand sons, the first humane principle I would teach them should be, to forswear thin potations and to addict themselves to [sherry]. Dry sherry is tremendously versatile and food friendly. It’s been called an acquired taste, but so are a lot of the world’s great pleasures. And this one really demands food to be at its best, so what better place to feature it than a restaurant? For the foreseeable future, we’re going to be using sherry in a few different ways, offering our guests a several opportunities to get re-acquainted with this remarkably versatile drink. We’re serving some delicious options by the glass, naturally. But if you order our new rhubarb tart, you’ll see that it’s plated with an amontillado sherry whipped cream. And we’ll be using amontillado in a cocktail (recipe below) to highlight its distinctive flavors in a completely different fashion as well. Sherry is an Anglicization of the term Jerez, the name for a region at the southern tip of Spain where sherry wines are produced. While various inexpensive blended sherries became the most common in the US during the 20th century, there are a wide array of styles being produced by bodegas, ranging from light and crisp fino to syrupy dessert sherries. 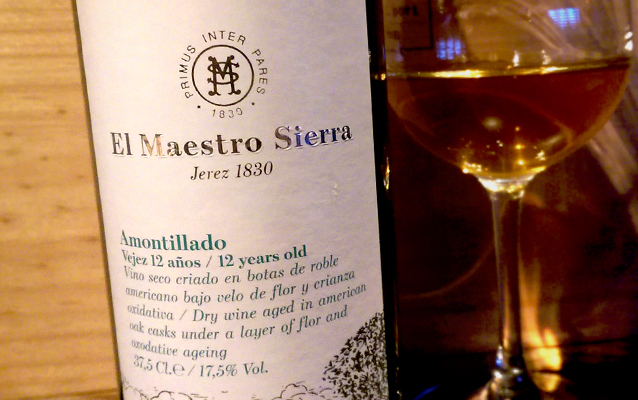 Drier styles include fino, amontillado, and oloroso. Each is produced from the palomino grape, grown in soils so chalky that they’re practically white. The wines are fermented as any other but then graded by a winemaker who determines if the wine is more elegant and headed for a fino barrel or more robust and headed for a future as oloroso. For fino, the wine is fortified with a wine/brandy mix to raise the alcohol up to around 15% and left to develop a cap of active yeast called flor. As the wine ages, protected by the flor from oxygen, it acquires saline, savory qualities all while losing weight and viscosity as the flor eats up the nutrients in the wine. If the fino ages so long that the flor beings to die, oxygen enters the wine and turns the fino into amontillado. And finally, a wine that was never suitable for flor to begin with is fortified to a higher alcohol percentage and left to age, oxidizing to produce the less-dry oloroso. PX and moscatel are grapes grown in less chalky soils, often harvested and dried on mats to concentrate the sugars before fermentation. Once fermented, some are fortified and others are not, but all are quite sweet and more suitable for a small apertif or dessert. Also known for its use in some high end rums, the solera system of aging is perhaps most famous for its implementation in Jerez. When wine is removed from a barrel for bottling, the wine is replaced by wine from a younger barrel. That empty space is in turn filled from an even younger barrel. And so on. When a bottle is labelled with an age statement (e.g., 12 years), that number refers to the average age of the resulting wine in bottle. We’re currently featuring an amontillado and an oloroso on the menu, though we have a second amontillado and a PX for those who really want to dive in and try several. As spring wears on, we’ll add a fino as well. 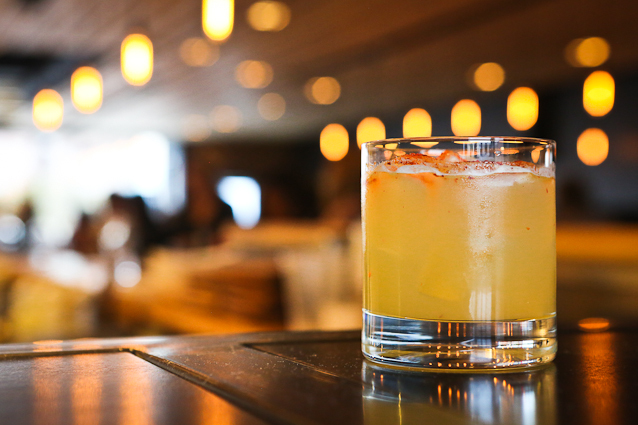 Additionally, we’re featuring a cocktail that puts amontillado’s nutty, savory flavors to the fore. If you enjoy it, consider making it at home using the recipe below. And remember: Whether you drink it with us or elsewhere, drink more sherry! We’d like to buy everyone a bottle of bourbon for the holidays because, hey, the support for our new venture has been outstanding. But alas, we just can’t. Instead, Andy put together a few recipes you might be able to use in your celebrations this year. Download the printable PDF recipe cards from the link below. Enjoy, and happy holidays! Grab the recipes from our website.